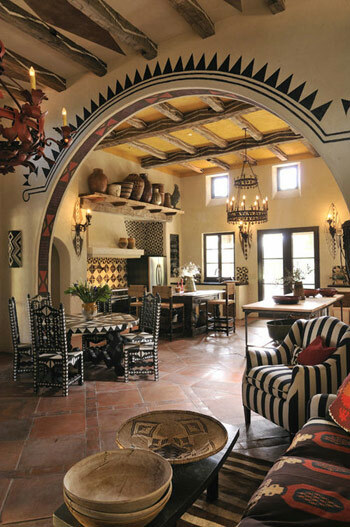 At the moment, ethnic-style is experiencing a second birth and is a very common design decision, but not every person can independently transform his home. However, you can order interior design in the company "Heshi Design", whose specialists will help to quickly and qualitatively draw up a design project. One of the most mysterious and bold ethnic-styles is the African one. It was born in the early twentieth century. The difference between the African style and others is that it gives energy, impetuosity and childish immediacy. Hi-tech, on the other hand, introduces restraint and a love of functionality. The main thing about which we should not forget - a full "immersion" in the situation of another country is superfluous and, at times, looks ridiculous. It is enough to place the accents correctly, that would plunge into the culture of another people, in this case, Africa. The rich culture of the African continent, the diversity of artistic traditions and the atmosphere of secrecy that enveloped Africa throughout human history, could not leave indifferent European artists and decorators. The hobby for Africa can be traced, at least, in three European styles of the 20th century: colonial, art deco and ethnic. African motifs are easily found in ornaments, decors, colors, textiles. But what basic features should a modern interior in the African style have? The artistic traditions that came from Africa can be divided into two large groups. The first is the style of North Africa. In this geographic region, there were many strong and bellicose states. Egypt, Algeria, Sudan, Morocco, Mauritania. Behind these names are the whole centuries of history, closely connected with Europe. The culture of North Africa has left a deep impression in European interior art. Associated with the national traditions of the Mediterranean countries, rich ornaments, juicy colors, vaulted architectural forms have become an integral part of the interiors of Southern Europe. Being politically and economically more connected with Eurasia, North Africa used to make a kind of cultural exchange, assimilated in European interiors. But there is another Africa. It is called the Black Continent. Its uniqueness began to be revealed to us only recently, about a century ago. Unlike much more secular countries of the Northern part of the continent, Black Africa has preserved very ancient cultural traditions, rooted in the times of the birth of mankind. The main theme of art here is our past. In addressing this topic, the African style is distinguished by deep and sincere naivety. There are no intricate images and complex allegories. The lines and outlines are straightforward and unsophisticated, the colors are saturated, and the emotions are open. Do not confuse simple and laconic pictorial traditions with simplicity and crude primitivism. So, in African sculpture, a three-dimensional image has always been taken, in contrast to the two-dimensional European one. The amazing plasticity of elements is inherent in all elements of the African style, even if they are executed in an angular and sharp manner. 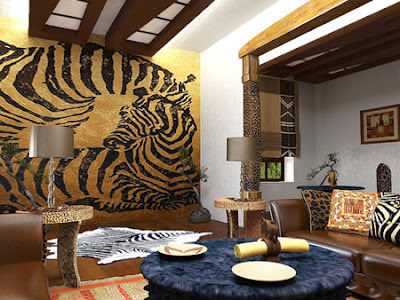 African interior design, first of all, ethnic, and only then - artistic. And, therefore, he has a reasonable practicality in the selection of furnishings, he rejects redundancy and excess. An important feature is the naturalness of the shapes, products and decoration materials that are used to create rooms in the African style. Of course, some of them will have to be replaced by imitation. Furniture made of ebony cannot afford even very well-to-do people, and ivory is not so easy to get in our latitudes. But where possible, it is necessary to strive for the predominance of natural materials. Not only precious woods or other rarities are suitable for giving the desired color. You can use a variety of materials, which we are abundant in supplying nature. Ceramics, clay, tree bark, even eggshells as decor for dishes or hand-made articles. Palm fiber, paper, jute fabric, dried flowers, leaves, fruits. Nutshells, feathers of birds, shells - as you can see, even a city dweller can easily pick up the elements necessary for decorating an African interior design. Recognizable style marker is a special color scheme. For the room will require warm tones of the natural scale. Despite the hot climate, African home decor with juicy tones - red, yellow, ocher, terracotta, chocolate brown. For expressiveness, a dense azure hue was added, and the contrast was provided by coal black. It is an obligatory element even in the event that you decide to decorate the interior in a calm sandy-creamy palette. African style includes many textile elements. 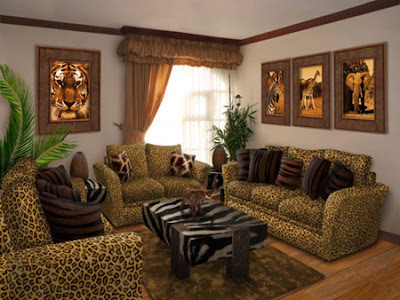 This is a picturesque carpet with an original pattern and fabrics that imitate fur and skins of African animals. They can lie on the floor, decorate furniture and walls. For windows, curtains made of natural linen or bamboo blinds are best suited, which look quite authentic, surrounded by typical African way of life. The floor can be decorated with wicker mats made of palm or coconut fiber. Especially they look well on the veranda, the terrace or at the foot of the chairs in the living room. 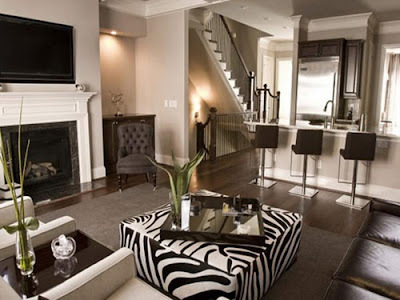 As for furniture, in the interior are appropriate items from natural wood of dark color or wicker furniture. Rattan furniture is also suitable for such a room. But do not get too carried away by the furnishings, in the ethnic interior there should not be more of them than necessary. Ethnic styles, in general, are very well suited for decorating living rooms. They give tremendous freedom of choice and selection of the right mood. Therefore, in the African style, not only the living room of a private mansion looks luxurious, but also a small room in a typical apartment. What will it take to give the room an African flavor? Let's start with the finish. As already mentioned, it is better to use natural materials for it. The walls should be painted better, and if the stucco under the painting does not come out perfectly smooth, then this is uncritical. Such strokes will only emphasize the uniqueness of manual work. The color and texture of the walls can be very diverse. White will make more expressive accessories and will give room to the room, brown will help in creating a cozy and slightly mysterious interior design with a lot of exotic ornaments. Sandy shade will highlight bright, contrasting details and will give a warm color to the whole space. Terracotta will magically look old. In addition, on the walls of the African decor for the living room is quite appropriate painting or decorative stickers in the style of primitive rock paintings. The walls can also be decorated with decorative panels made of wood or thin bamboo. Typically, such a coating is selected in order to donate the selected space. On the floor, it is best to put a parquet board or make it from natural wood. The boards can be stained, but not varnished and not painted with oil paints. Glitter and gloss are completely uncharacteristic for thick, matte color overflow in African style. Well-proven and ceramic tiles. It can repeat the design of sandstone slabs, an old stone or imitate traditional African motifs. Tile is better to choose a large, matte. The ceiling can simply be whitewashed. Other options for natural design are also suitable. For example, wooden beams or bundles of thin rods, like sorghum. Furniture in such a living room will require a laconic, simple form, low. Better than a dark tree. Excellent fit a variety of wicker items. They should not be performed in one weaving technique, otherwise, an excessively formalized image will be created. Ethnic styles welcome diversity. Objects of interiors should be well processed, but not polished. On the contrary, matte, pleasant to the touch textures and surfaces is much more suitable for the African interior design. It should be noted that tactile perception plays an important role here. Hot emotions and hot sensuality are as much a part of the interior atmosphere of Africa as decors or masks. Chairs and armchairs can be provided with textile cushions, which are easy to replace and clean. Covers and capes for furniture are not very characteristic unless they are blankets and bedspreads made in the design of animal skins. The upholstery of upholstered furniture is preferable to natural simple fabrics. Suitable jute, teak, linen. Coloring can choose any - restrained, the color of untreated flax or bright, contrasting, the color of the sunset African sun or desert sands. 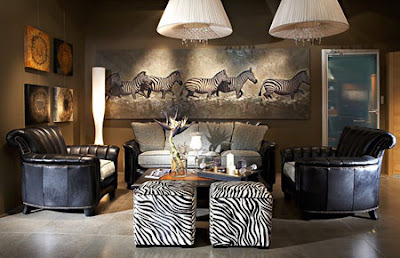 You can again turn to the animal theme and buy a sofa "under the zebra" or "giraffe". On a monophonic upholstery, decorative pillows with an elaborate African ornament will look great. Traditional drawings adorn not only textiles. 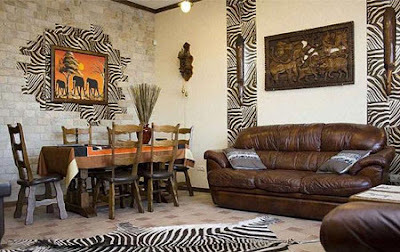 Part of the wall or column, niche or doorway, too, can be decorated with patterns of animal skins or ethnic paintings in African style. This will give a fresh and original look to the room. 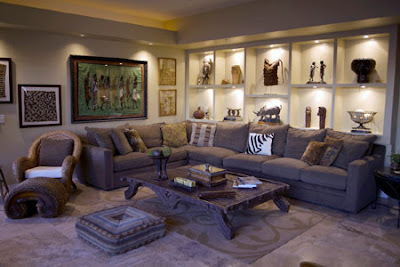 african Decor for the living room can be high wooden vases, figurines of typical African animals, hunting trophies or figures of hunters. 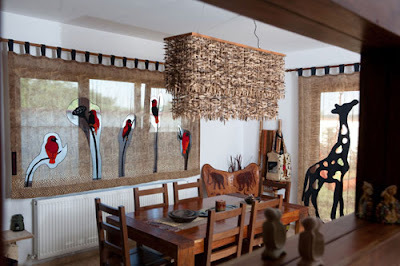 The most daring can allow decorating the interior with spears, bows and other traditional weapons of African hunters. Popular decorations are also musical instruments, in particular, drums-tam-tams, they look very picturesque, and on some, you can even sit. Designers, inspired in this way, offered padded stools and chairs in the form of tam-tams. 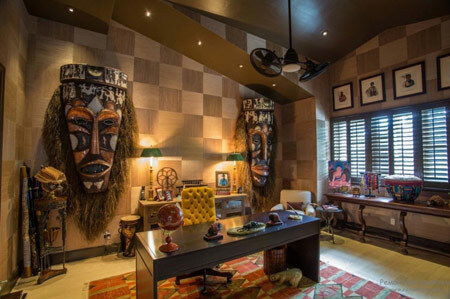 Separately it is necessary to tell about such traditional decor of the African interior design, as a mask. They are so diverse that it's hard to resist buying a couple to decorate the house. But first it is better to clarify what exactly the masks you have chosen symbolize, otherwise, without knowing the subject, you can unwittingly decorate your house with a not very favorable thing, from the point of view of the energy impact. Even if you are not a superstitious person, it is better not to argue with other people's traditions that exist for many centuries. So before buying such an ornament, it is better to consult a knowledgeable person so as not to buy a portrait of some malignant spirit. 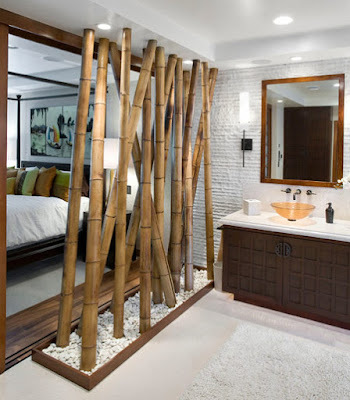 The natural design, a large number of natural materials and the atmosphere of free creativity, peculiar to the African style, makes it very attractive and for the design of the bedroom. 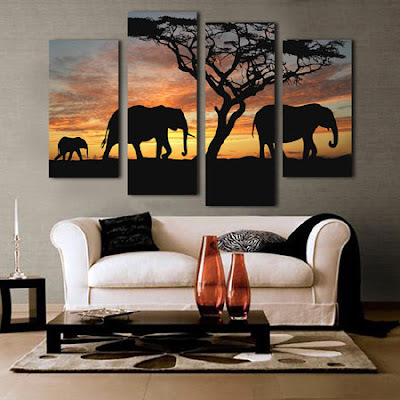 How to give your favorite room for relaxation a real African look? 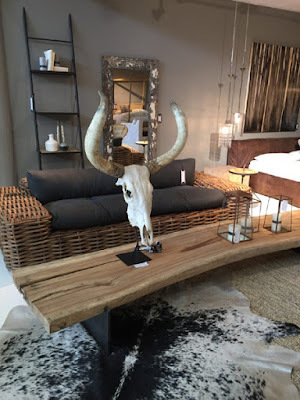 Furniture made of natural wood, preferably dark, almost black, will look good in such a bedroom. Add a real highlight - the canopy above the bed. He must depict a mosquito net from insects, without which no African interior design can manage. For a canopy, a lightweight white fabric or a mesh structure is suitable. It can be mounted directly on the ceiling or on special bedside columns. Simple chairs, wicker chairs and a dressing table made of black wood will help to complement the bedroom. Instead of chairs or chairs, you can use wide low poufs, which are covered with ethnic ornament. They look much more stylish, but in use are extremely practical. The bedroom in the African style is often performed in rich, natural tones. This adds room privacy and mystery. To such expressive colors of decoration, textiles with an imitation of skins, or fabrics in national African ornaments, will suit. Suitable are large decors, for example, high vases, paintings, mirrors in wooden frames, art photographs. 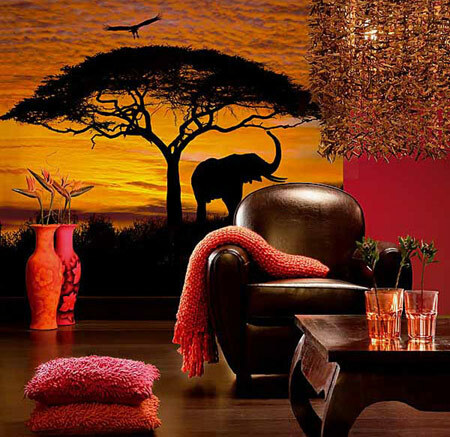 In a small room will be the very appropriate three-dimensional wallpaper on an African theme. On the one hand, they support the topic, on the other hand, they help to expand the space. As a chandelier, you can use a design that mimics a fan with wooden blades. 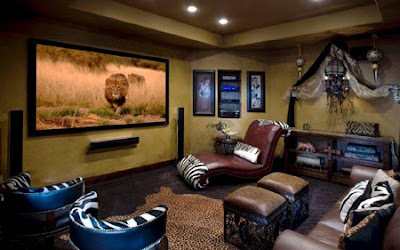 In the African interior design, you can use additional lighting. Particularly good are floor lamps with laconic shades with traditional ethnic patterns. 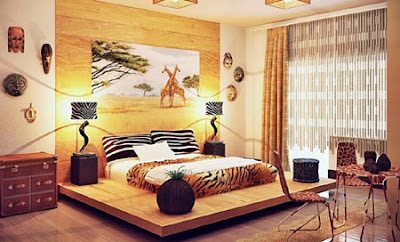 Bedroom in the African style can be very elegant, if you use dark wood furniture with leather inserts and decorate the room with real living plants, for example, palm trees. Complement the overall picture of small, but expressive decors. African style in the interior design does not limit the creative approach to strict rules and rigid frames. 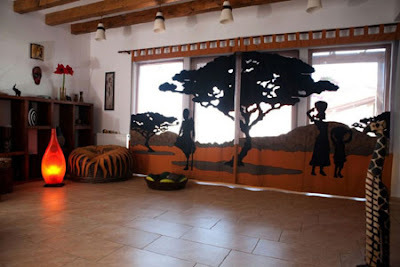 Creating an African style, do not forget about the lighting of the room. As the main central light, you can use a large size chandelier with a wooden or metal finish. And as a large round crystal chandelier, with a lot of "droplets". The light coming from the chandelier will be refracted in the pendants, "play" and generously "pour" around the room, reminding of the merciless sun of Africa. 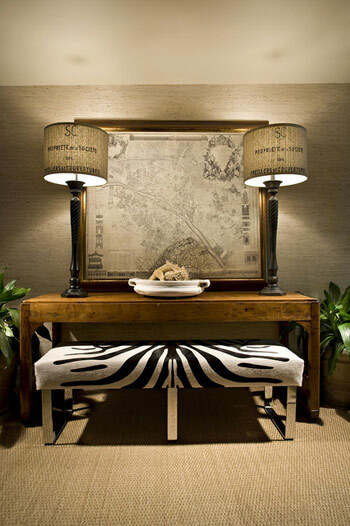 Floor lamps should have bright lampshades made of leather, decorated with ornaments, or braided lampshades. 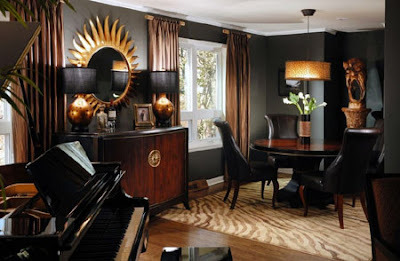 Table lamps can have a lampshade of dark colors, even black, with a geometric pattern. It should be noted that elements of African decor design are characterized by unusual external dynamism, personify the hot temperament of the inhabitants of the continent and have a charge of positive energy. 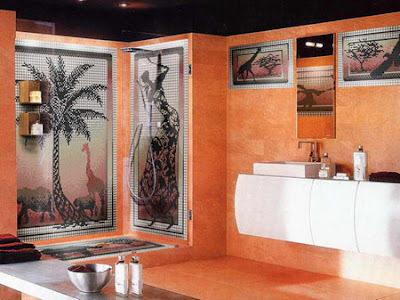 They can be traced in many style solutions, for example in art deco, ethnic and colonial. Figurines, paintings, drawings, engravings depicting birds; decor elements made of ivory, tortoiseshell, clay, wood, metal; musical instruments of the peoples of Africa; hunting trophy accessories (animal heads, teeth, horns, fangs, etc. ); armament items; items that have a mystical meaning (shaman masks, amulets).